Great news to all TnT subscribers. Here’s the new Talk N Text UnlitxtPlus20 Promo wherein you can avail of Unlimited Text plus 30 minutes of calls to Smart, TNT, and Sun networks, and you also get to Unlimited Facebook browsing, posting & updates for 2 days for only Php 20. This Talk N Text UnlitxtPlus20 promo with unli surfing, unli text and 30 mins calls to Tri-Net subscribers allows you to stay in touch with your friends and loveones more often today. Register now! But wait there’s more offer from Talk N Text UnlitxtPlus20 Promo, simply add Php 5 and you will avail an extra one (1) day Text and Call. So what are you waiting for? 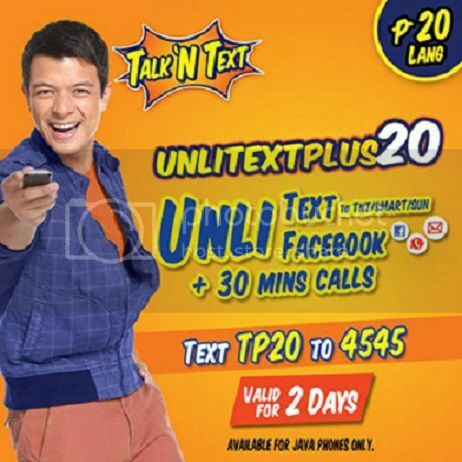 Subscribe now with Talk N Text network to avail of this amazing unlimited promos.